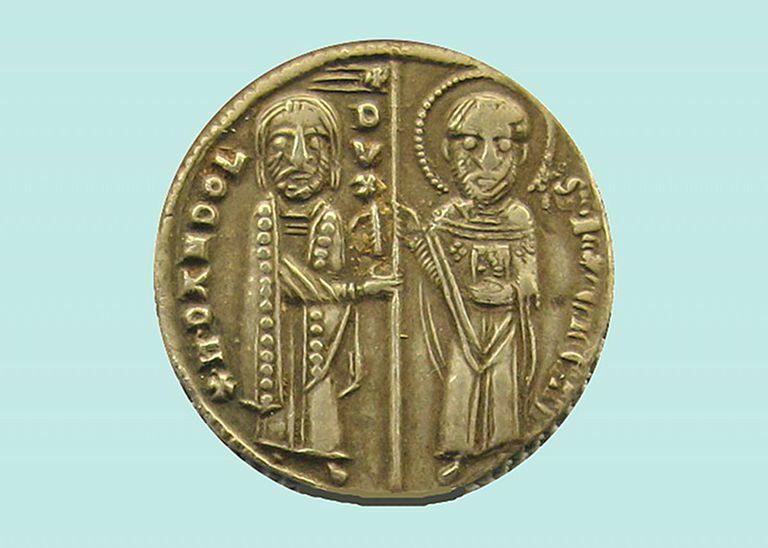 12th-century Venetian grosso depicting Enrico Dandolo. Adapted from a photo by Sailko; made available through the GNU Free Documentation License. funding, organizing, and leading the forces of the fourth Crusade, who never reached the Holy Land but instead captured Constantinople. He is also famous for taking the title of Doge at a very advanced age. The Dandolo family was wealthy and powerful, and Enrico's father, Vitale, had held several high administrative positions in Venice. Because he was a member of this influential clan, Enrico was able to secure a position in the government himself with little difficulty, and eventually he was entrusted with many important missions for Venice. This included a trip to Constantinople in 1171 with the doge at that time, Vitale II Michiel, and another a year later with the Byzantine ambassador. On the latter expedition, so diligently did Enrico protect the interests of the Venetians that it was rumored the Byzantine emperor, Manuel I Comnenus, had him blinded. However, although Enrico suffered from poor vision, the chronicler Geoffroi de Villehardouin, who knew Dandolo personally, attributes this condition to a blow to the head. Enrico Dandolo also served as Venice's ambassador to the King of Sicily in 1174 and to Ferrara in 1191. With such prestigious accomplishments in his career, Dandolo was considered an excellent candidate as the next doge -- even though he was quite elderly. When Orio Mastropiero stepped down in order to retire to a monastery, Enrico Dandolo was elected Doge of Venice on June 1, 1192. He was believed to be at least 84 years of age at the time. As doge, Dandolo worked tirelessly to increase the prestige and influence of Venice. He negotiated treaties with Verona, Treviso, the Byzantine Empire, the Patriarch of Aquileia, the King of Armenia and the Holy Roman Emperor, Philip of Swabia. He fought a war against the Pisans, and won. He also reorganized Venice's currency, issuing a new, large silver coin known as the grosso or matapan that bore his own image. His changes to the monetary system were the beginning of an extensive economic policy designed to increase trade, most especially with lands to the east. Dandolo also took a keen interest in the Venetian legal system. In one of his earliest official acts as ruler of Venice, he swore the “ducal promise,” an oath that specifically laid out all of the duties of the doge, as well as his rights. The grosso coin depicts him holding this promise. Dandolo also published Venice's first collection of civil statutes and revised the penal code. These achievements alone would have earned Enrico Dandolo an honorable place in the history of Venice, but he would earn fame -- or infamy -- from one of the strangest episodes in Venetian history. The idea of sending troops to the Eastern Roman Empire instead of to the Holy Land did not originate in Venice, but it is fair to say that the Fourth Crusade would not have turned out as it did were it not for the efforts of Enrico Dandolo. The organization of transportation for the French troops, the funding of the expedition in exchange for their help in taking Zara, and the persuading of the crusaders in helping the Venetians take Constantinople -- all of this was Dandolo's work. He was also physically in the forefront of events, standing armed and armored in the bow of his galley, encouraging the attackers as they made their landing at Constantinople. He was well past 90 years old. After Dandolo and his forces succeeded in capturing Constantinople, he took the title "lord of the fourth part and a half of the whole empire of Romania" for himself and for all the doges of Venice thereafter. The title corresponded to how the spoils of the Eastern Roman Empire ("Romania") were then divided as a consequence of the conquest. The doge remained in the capital city of the empire to oversee the new Latin government and to look out for Venetian interests. In 1205, Enrico Dandolo died in Constantinople at the age of 98. He was entombed in the Hagia Sophia. Concise bio by Louis Bréhier at the Catholic Encyclopedia.